Odfel's House is a house in the small mining settlement of Shor's Stone. It is the home of two local miners, Odfel and Grogmar gro-Burzag. 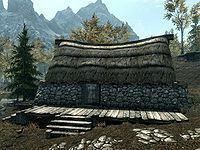 It consists of one area only, Odfel's House. Odfel and Grogmar each occupy a different half of the building, and spend all of their time arguing about who cleans up the most, at times even betting about it. Despite the name of the house, it seems Odfel desires to leave it to Grogmar and build a new one. The front door opens to the sight of a sizzling fire and a cooking pot that marks the center of the house. In front of the pot is a small dinner table with a bottle of alto wine, a slice of bread, and a copy of Rising Threat, Vol. IV. Underneath the table lie a pine thrush egg and a leek. Next to the fireplace is a set of shelves with beverages, four bottles of alto wine, and four bottles of regular wine. The southern part of the house clearly belongs to Odfel, although both owned beds stand there. At the foot of the bed in the southeastern corner sits a chest with few valuables. Between the beds is an end table with a bottle of Nord mead on top and an empty wardrobe. Between the beds and the front door is a dresser with some clothes with several alchemical ingredients on top: four clusters of garlic, three pine thrush eggs, two samples of frost mirriam, and two samples of elves ear. Above the dresser hang three garlic braids, and one portion each of dried elves ear and dried frost mirriam. 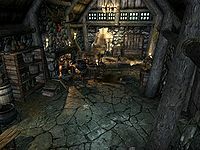 The northern part of the house holds little of interest and is more messy than its southern counterpart, with the exception of three food barrels and a bottle of Nord mead and one bottle of alto wine on the table. Also, hidden in a bucket on the table, are three potatoes. Above the table hang one dried frost mirriam, one dried elves ear, and two garlic braids. From a hook hangs some game as well, three rabbits and three pheasants.